Component temperature requirements derive from the spacecraft's thermal design. To test a component under thermal vacuum, we mount it to a temperature-controlled base plate inside a vacuum chamber. The vacuum chamber's walls have thermal shrouds for cooling or heating. Using conductive coupling to the base plate and radia tive coupling to the chamber walls, we can cycle the component through its specified temperature range. The component must work at temperature extremes and during transitions. The temperature extremes equal or slightly exceed expected temperatures for the acceptance test and exceed expected temperatures by a margin (typically 11"C) for the qualification test Sometimes, the thermal-vacuum qualification test may include a cold soak to demonstrate survival at low temperatures. Figure 12-4 shows a typical temperature cycle. Fig. 12-4. 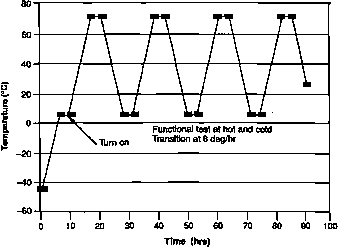 Typical Temperature Cycle for Thermal-Vacuum Test of Components. The key issues on the thermal-vacuum test are temperature extremes, pressure level and number of cycles necessary. We do not always know what a spacecraft "component" is. For example, we may define the solar array and individual antennas as components and qualify them separately, or we may test them environmentally as a part of the complete spacecraft. The structure is tested by static loading but receives its environmental exposure as a part of the spacecraft Mechanical assemblies, such as deployment joints or hinges, may be tested at qualification environmental levels separately as components or as part of the spacecraft. The qualification program should evaluate each spacecraft function and all environmental effects the spacecraft may encounter. Table 12-8 lists the steps for designing a qualification program. Hrst, we must prepare a list of all spacecraft and payload functions, as well as equipment (including redundancy), all modes of operation (including failure modes and backups), and software code. The system and subsystem specifications should provide this information. Second, we identify environmental effects, including those on the launch vehicle (acoustics, vibration, and shock) and in orbit (temperature, vacuum, and radiation). Third, we check to see which spacecraft functions must be tested with each environment Fourth, we identify the major spacecraft configurations that require qualification, typically including a boost configuration and one or more on-orbit configurations. Fifth, we devise functional tests for each of these major configurations which completely evaluate the spacecraft. Sixth, we lay out the sequence of tests and environmental exposures. Finally, we must identify program span time and test equipment requirements. TABLE 12-8. Steps In the Design of a Spacecraft Qualification Program. This is a typical approach for a high reliability program. Test each spacecraft and paylcad function for proper operation. Identify the top functional requirements of the spacecraft in the top system specification, and glean subsystem functions from the subsystem specifications. Environments for transportation and storage, launch, and orbit include vibration, shock, temperature, vacuum, and radiation. During transportation the spacecraft is off, although sensitive components may be powered. During launch, some equipment will be in standby and some will be operating. 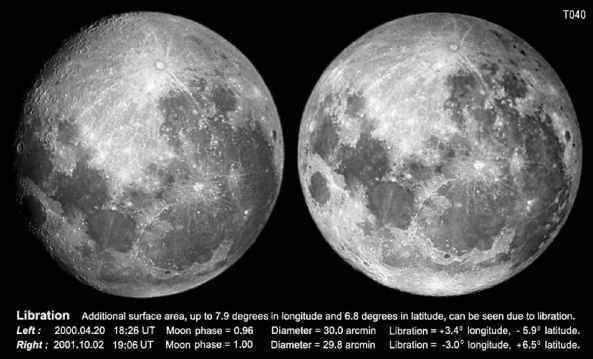 Test the operating equipment during spacecraft vibration and check all modes of on-orbit operation. Include boost configuration and one or more orbital configurations. Test each function appropriate to a particular configuration, Including all equipment and software. See Fig. 12-5 for a typical sequence.